One stop clear air solution for Pathology Labs, Pharmaceutical Industries, Medical Institutions & Biotechnology Units. Our reputation in the market is largely attributable to our precision-designed Laminar Air Flow. This laminar air flow is developed from the best quality components and hi tech technology in accordance with universally verified standards. Offered laminar air flow is known for providing a bacterial, fungal and air born particle or dust free work space. Also, our laminar air flow is tested on several provisions for delivering a flawless range to customer’s end. Available in Stainless Steel, Electrogalvanized Steel & wood chambers. Centri-balanced, centrifugal motorized blower with ISI(IS996-1979) marked motor, 1/3 H.P. 1440 RPM. Blower Unit Centri-balanced, Centrifugal Motorized Blower With ISI(Is996-1979) Marked Motor, 1/3 H.p. Illumination Fluorescent Tube Illumination With Light Intensity Ranging 800 To 1000 Lux. Illumination 20w Pre-filter 1 No.s. Manometer Block Type Acrylic/plexi-glass Inclined Static Pressure Manometer. Support Stand Metallic Square Pipe Stand With Leveling Device & Castors. Warranty : 2 Years. Other Specifications Mentioned In Catalogue. We are instrumental in providing our clients a comprehensive range of Fume Hood. Our fume hood is designed to contain and exhaust toxic, obnoxious or otherwise harmful gases, vapors, mist etc. to protect personnel & equipment. 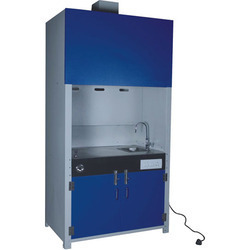 The fume hood offered by us is made available by us in varied specifications & customized options to choose from. 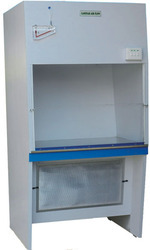 This fume hood is provided at market leading price within a given time frame in quality packing. Designed to contain and exhaust toxic, obnoxious or otherwise harmful gases, vapors, mist etc. to protect personnel & equipment. Fabricated out of Best quality thick weather resistant board clad in mica lamination from outside. Chemical resistant Epoxy painted inner chamber. Ceramic tiles or S.S. sheet coveres working platform. Provision for gas and air connections.